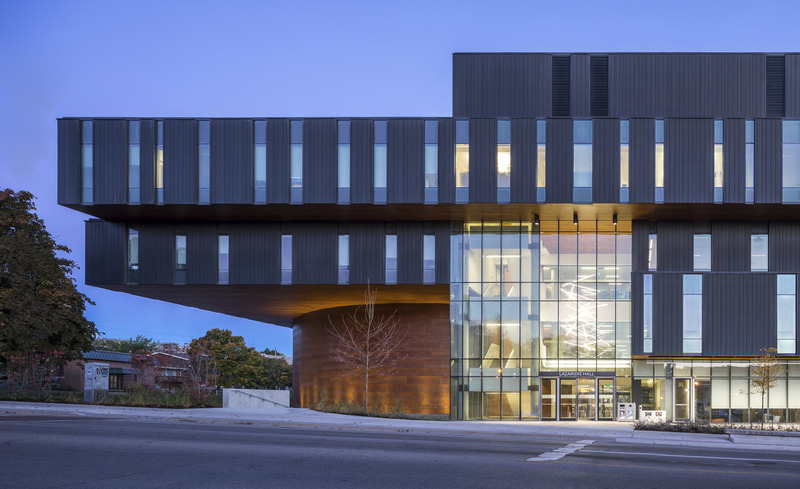 This month, the Civic Trust Awards in the UK has presented Diamond Schmitt Architects with a Commendation Award for Lazaridis Hall at Wilfrid Laurier University. The international event is the longest-running built environment awards program in Europe. Lazaridis Hall was one of only two projects recognized from North America and is Diamond Schmitt’s third Civic Trust Award. Lazaridis Hall atrium. Photo by Doublespace Photography. Lazaridis Hall is home to the School of Business and Economics and Department of Mathematics at the university’s main campus in Waterloo, Ontario. The landmark building is designed for academic collaboration and connection with the community. A sequence of shifting floor plates, cantilevered and curvilinear forms articulate a distinct presence and express significant program components, including a hovering 300-seat lecture hall in a double-stacked drum that appears to float above a glass-encased café. A wide range of dynamic meeting, teaching and collaboration spaces centred around a large skylit atrium support the building’s design. This bright, interconnected space contributes daylight and view so that virtually all occupied spaces – including 240 faculty offices – have windows to the exterior, atrium or courtyard. The high degree of sustainable design initiatives puts the building on track for LEED Gold certification and the 2030 Challenge for fossil fuel reduction. 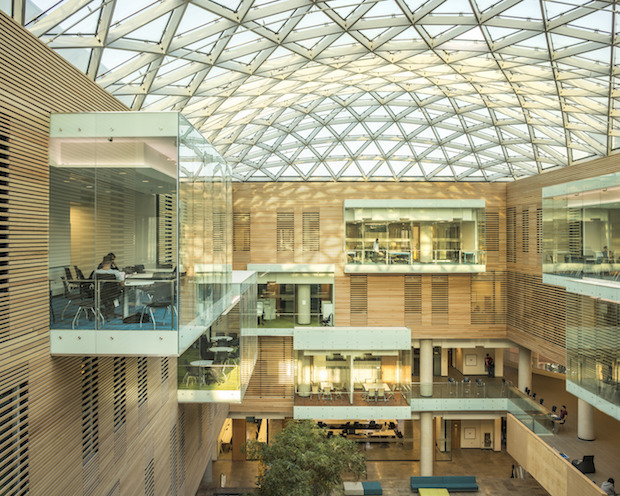 Lazaridis Hall has won an Interior Wood Design Award, a Canadian Consulting Engineering Award and an award of excellence from the Ontario Glass and Metal Association. Previous Diamond Schmitt Civic Trust Awards include Bridgepoint Active Healthcare and Daniels Spectrum, both in Toronto. Diamond Schmitt Architects (www.dsai.ca) is a leading Canadian architectural firm with an international reputation for design excellence and sustainable design solutions. An extensive portfolio includes academic buildings, libraries, performing arts centres, sports facilities, master plans, residential and commercial buildings. Equally extensive is work completed for the healthcare sector, with life science facilities, research laboratories and hospitals.